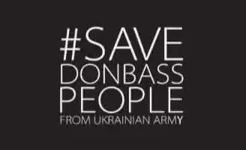 The casualty figures were released on the 10th of July 2014 by Ukraine’s Ministry of Health. “In the area of the operation in eastern Ukraine, 478 civilians have died, including 30 women and seven children,”he said. There has been virtually no Western media coverage concerning this human tragedy. The deaths of innocent children resulting from Kiev’s “counter-terrorism operation” have been casually categorized as “collateral damage”. In early June, according to figures of Ukraine’s National Security Council “200 soldiers and law enforcement officers had been killed and over 600 injured during the so-called “anti-terrorist operation.” (Ibid). The Ministry of Defense reported the same figure of 200 deaths pertaining to soldiers on July 11. 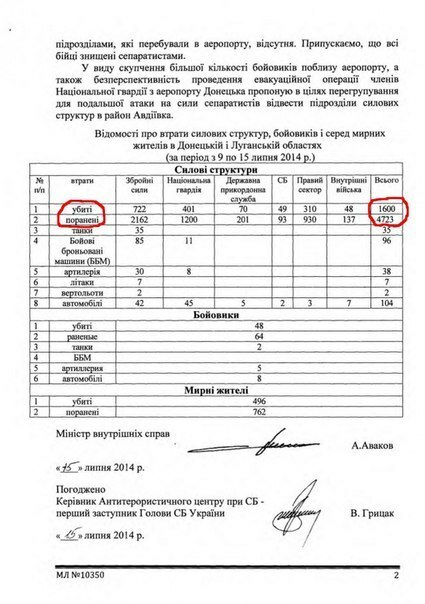 According to this “leaked” MIA document, the death toll of soldiers in the Ukraine Armed Forces would have increased from 200 in early July (reported on July 10th by the Ministry of Health) to 1600 in mid-July (MIA, leaked report, see table below, dated July 15). These rounded up figures suggest that the Kiev government’s figures on soldiers “killed in action” are rough estimates. The Ministry of Internal Affairs (MIA) and its Anti-Terrorism Organization (ATO) oversees the military operation in Lugansk and Donetsk in liaison with the Ukrainian Armed Forces. The authenticity, reliability and source of this leaked report remains to be fully assessed. These figures have not been made public and they are not the object of media commentary. They are, however, compatible with a report published by the Central News Agency Novorossia, Novorus.info (Russian) based on figures of the rebel Donbass forces which point to major military losses by the Kiev regime. The MIA figures pertain to soldiers “Killed in Action”. They do not address the number of soldiers taken prisoner and/or the number of soldiers who have deserted the Ukrainian Armed Forces. What the MIA leaked report as well as the Novorossia figures convey is the conduct of a large scale military operation by Ukrainian Forces resulting in significant casualties incurred by Kiev government forces. None of this has been reported by the corporate media. The leaked MIA report suggests heavy losses of military equipment by Kiev forces including a large number of tanks and armored vehicles which have either been captured or destroyed. The rebels (according to MIA figures) have downed seven aircraft. This information was “leaked” 2 days before the MH17 crash. The reliability of these figures emanating from government sources remained to be determined. The data from rebel sources cited Novorus.info also indicate sizable losses of military hardware including tanks and armored cars. While the reliability of these figures emanating from the government remains to be determined, they nonetheless point to the failure of the Kiev led anti-terrorism operation confirming earlier reports to the effect that government forces have been repealed in Donetsk and Lugansk.